www.husitstvi.cz • Zobrazit téma - Hussites symbols? In many books, about hussites like Durdik, Wagner, Osprey and many others, they have a symbol of chalice on hoods. But i didn't saw that on any sources from XV c.. Maybe You know something about that?? you are right. 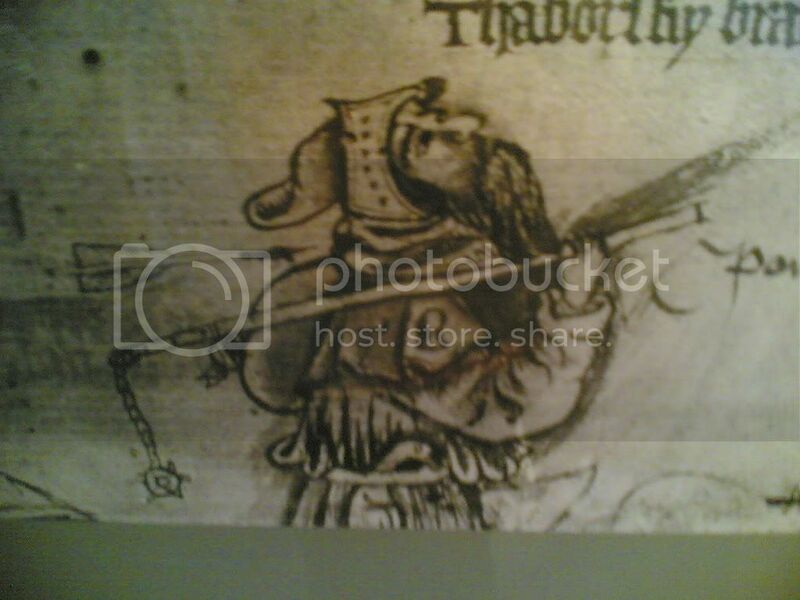 I diped all my books and I did not find any picture (from medieval annals) which would confirm using the chalice on soldiers' clothes (hoods) as we can see in "modern" sources. It seems that Hussites used chalice only on banners and shields. This is a contemporary caricature of a Hussite. It is not a evidence of a chalice on the clothing. Also note the goose on a belt, as a symbol of Jan Hus. Wagner use this figure in costume, armor and weapons as a template for a soldier in the first half of the 15th Century. Předmět příspěvku: Re: Hussites symbols? I'm sorry about digging old topic. But I am looking for this symbols too. I can't find them anywhere. Could you help me?